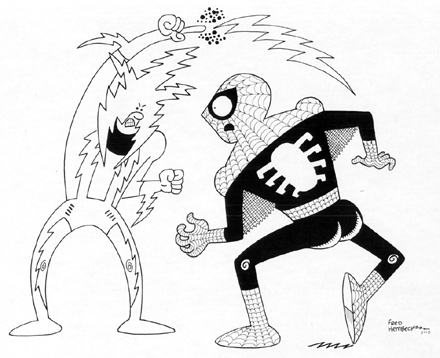 They were Marvel's answer to Archie and Reggie! 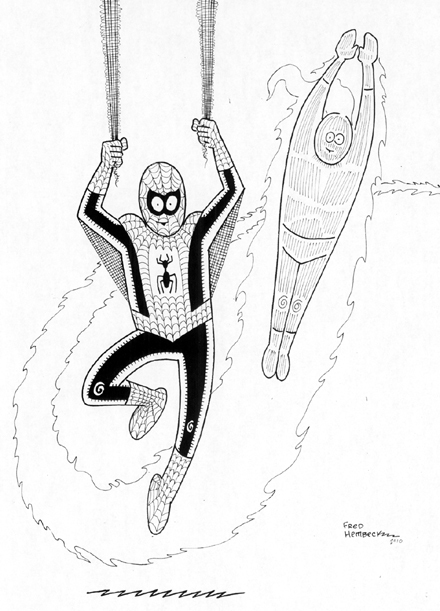 The Human Torch joined his webspinning rival for 1963's special "Tribute To Teen-Agers" issue of AMAZING SPIDER-MAN,#8, and you can get a closer look at my version of Steve Ditko's cover (as well as the original itself) by clicking on the image over to the side! 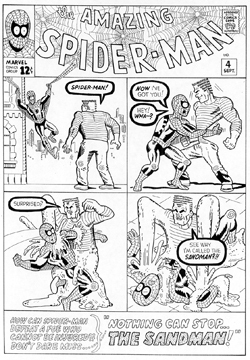 My personal favorite to draw of all the classic Steve Ditko designed super-baddies has to be Flint Marko, aka The Sandman. 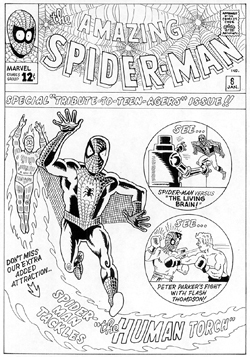 Here's my version of his debut on the cover of 1963's AMAZING SPIDER-MAN #4--click the accompanying image for a peak at both the original and larger look at my take. 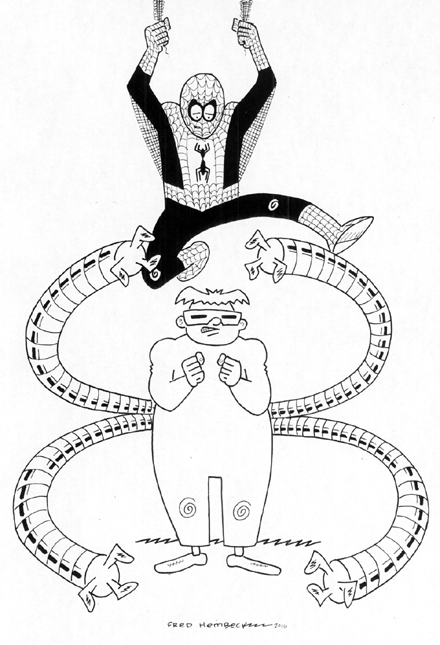 The third issue of AMAZING SPIDER-MAN introduced the notorious arch-villain--and eight limbed--Dr.Octopus to the world. 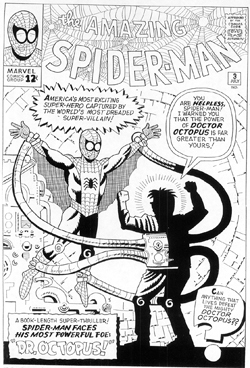 Let me now introduce you to MY version of Sensational Steve Ditko's 1963 cover via the link embedded in the image over yonder, your one-way ticket to a glimpse of the original AND a much larger scan of my interpretation! Eight arms to hold you indeed!! 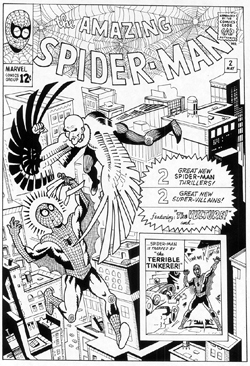 Time to take a trip in The Way-Back Machine (via The Hembeck Express) as I offer up my slightly off-kilter version of Sturdy Steve Ditko's cover for 1963's AMAZING SPIDER-MAN#2, featuring the debut of senior citizen super-villain, The Vulture (not to mention a panoramic view of Ditko's Manhattan). 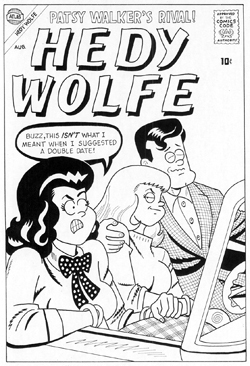 Click the accompanying image to see the original cover, plus a much larger look at my take. Yours truly will be a guest at the Lehigh Valley Comics Con in Pennsylvania this Saturday, May 22nd. The show hours are 10 am through 4 pm, and inasmuch as it's a pretty hefty haul getting there for Lynn and me, I can't say for certain I'll be there exactly when the doors open, but I should be at my table pretty soon after!! It's gonna be fun, so if you're in the area, please stop by--I look forward to meeting comic-loving inhabitants of the worlds biggest pencil!! Additional intel can be found via the link above!! I've been pretty darn busy lately. Lynn and I spent a few days last week upstate, helping daughter Julie pack up and get ready to return home after completing her second year of college. Plus, I finished up a couple of projects recently and am currently working on an even more extensive (and exciting one), details of which I'll share with you in the very near future. So, I really haven't had enough time to properly write up the last two dozen or so flicks I've seen--time to watch 'em, yes; write about 'em, no. Except I saw one last night that simply DEMANDED commentary: "The Blue Gardenia". As a bonus, I've at least listed the other movies I tuned into in recent weeks: title, date, running times, and notable cast members. Hopefully, I may yet get the chance to someday go back and append a few comments. It'd be a shame to ignore such unsung gems as William Powell in "Jewel Robbery", Edward G. Robinson in "A Slight Case Of Murder", and the surprisingly complex plot of "Hell's Angels '69"--not to mention my first (three) encounters with Andy Hardy and (two) with Dr. Gillespie!! But for now, it's back to the drawing board!! 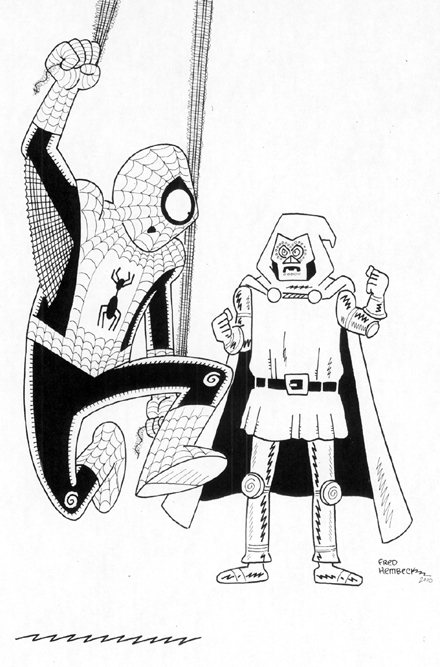 Y'know, it's always big-time fun to draw Spider-Man--AND his friends and foes alike! To see 'em larger, click on the above images to get a closer look. And if you're interested in purchasing any of 'em, here's access to our latest round of Ebay auctions! More anon, pals and gals!! Paging through TwoMorrows nifty new publication, "Sal Buscema Comics Fast and Furious Artist" by the dynamic duo of Jim Amash (author) and Eric Nolen-Weathington (layouts, transcription, and co-editor)(which I recommend that you grab a copy of via the link provided above should you not already claim a copy as your own), two things came to mind. 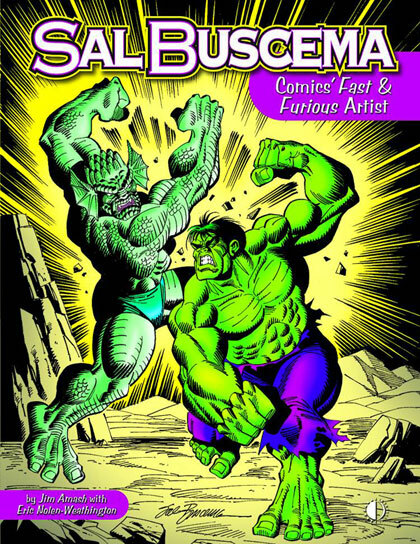 One: I should share with you folks my version of Sal's cover for AVENGERS #89, likely my all time favorite junior Buscema brother cover--follow this link for a look. 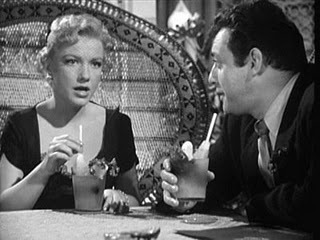 Now, if I could just drag myself away from TCM, I might actually find some time to READ the darn thing!! But I've enjoyed enough top-notch work credited to these fine scribes to confidently give this the thumbs up anyway! And we're launching things with a dozen fresh reviews, including half a dozen early Bogart pics (including "Kid Galahad", with Bette Davis and Edward G. Robinson, pictured above). Plus, you've got Fatty Arbuckle in love, Olivia DeHavilland in the loony bin, Jeff Bridges on stage, Ava Gardner on fire, Lucille Ball in a truncated series, and Death captured in a tree by Lionel Barrymore!! Additionally, I watch a man die right before my very eyes!